Happy holidays fellow bloggers! I hope you all enjoy time with loved ones whilst eating lots of yummy Christmas food! I have to say, despite dressing up all festive for work, listening to the same Christmas playlist on repeat and having to post christmasy instagram shots – I have never felt less festive in my whole life than I do this year. I’m not sure what it is, my friends have said I’ve just grown out of Christmas – BUT DOES THAT EVEN HAPPEN? I think it must be because my family this year aren’t really into it this year (it’s been going downhill since me and my sister have been growing up and caring less) and maybe because I’ve spent the last two Christmas’ in retail. This year I’ve been planning to just study for my January exams more than anything. 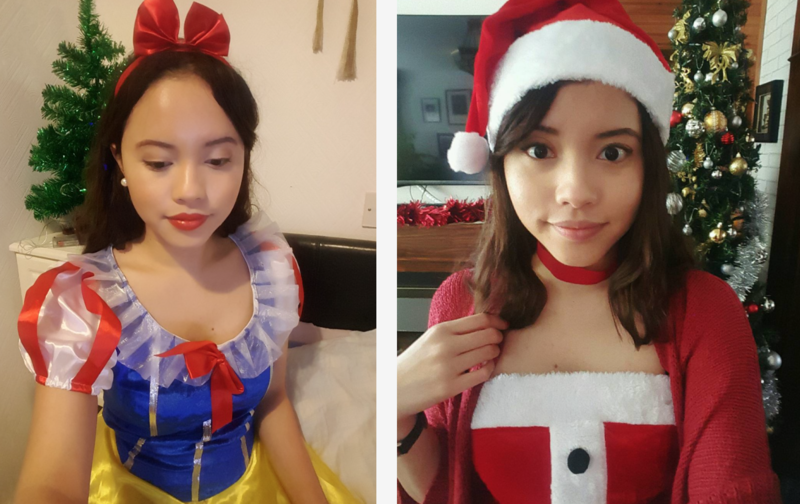 I was Snow White and just your generic Santa’s little helper girl thing. I love to dress up – they always make things a lot more fun! Customers mistook my Snow White costume for a variety of different princesses; one being Elsa. Re-watch your Disney movies, kids! I’ve gotten to that point in my life where I just wonder why at this festive season where all the Christmas songs and messages preach about being happy and grateful – is the season where some people are so bitter and definitely, ungrateful. I’m thanking everyone who gets me socks for Christmas, my feet are nice and toasty than before I got the socks. Thank you. So, let’s talk about the highlight of this season: Star Wars. Because December 2015 is all about Star Wars to me than actual Christmas. Ha! I watched it in cinemas a week ago and absolutely loved it. I went straight after my anatomy exam which made me enjoy it a lot more I have to say. I don’t want to say much as I might end up typing out the whole plot (which I’ve seen some articles on Facebook do; maybe that’s why many Star Wars fans stayed away from the internet!) All you guys need to know is: it’s awesome, go watch it if you haven’t already AND if you aren’t caught up with the Star Wars series then go back and watch it – you’re gonna love it, I guarantee. Half way through the movie, I obviously drank too much coke and needed to go to the toilet. But I absolutely hate missing parts of movies, especially Star Wars. My boyfriend downloaded this app during the movie called, RunPee. It basically tells you parts of the film where you can get up and go to the loo. But as I said before, I didn’t want to miss any of it! So I used the force and waited until the end. You make such a cute little Snow White! I have actually grown out of Christmas a loooong time ago. I hated this time of the year when I was forced to stay home and spend it with my dysfunctional family… Now, though, I may not spend it with my dysfunctional family, but the holidays still leave a bitter taste in my mouth. Not sure why. Boyfriend is making huge efforts to make the Christmas holiday tolerable, which I definitely appreciate because I have always been sad at this time of the year. Hope you have a good holiday even if you plan on spending a lot of time studying. Been there before! Happy holidays, Pauline! It’s awesome to hear that you’re feeling very festive! I think Christmas gets more better every year. I have a lot of respect for those in retail during the holidays because of all of the crazy hours they have to work. So thank you!!! It’s cute how you dressed as Snow White! I don’t understand how Snow White’s dress can be Elsa’s???? Isn’t her’s all light blue? Happy holidays, Pauline! It’s interesting how you didn’t feel as festive as the other years. I think sometimes the holidays just become the same every year, so the novelty wears off? I kind of feel the same, and all I care about is the fact that it’s a day off for me, haha! LOL, it’s so funny that you really had an app to tell you which parts of the movie you can skip for toilet break! Haha! It’s good you got to hold it in until the end though, the new Star Wars is too awesome that you just have to watch every second of it. The Force helped you through with this ordeal, lol! Both of your costumes are extremely adorable. I honestly love your Santa outfit. I just can’t believe that people could/would mistake Snow White for Elsa’s dress. Maybe they are similar to each other, and that’s why people thought it was hers? All I know is, these people need to re-watch Snow White, a definite old classic of Disney. I think people should be grateful for the things they receive, instead of the things they don’t. I got a few things all ready, and I am incredibly grateful for them. I really wanted this one lamp from somewhere as I had a horrible and ugly looking lamp, that a friend of gave me. It suited well for the job, however, it was just incredibly ugly. So, I asked for a lamp, and that’s what I received. I don’t think people should be making Christmas all about presents, but the fact that they get to spend time with their family…should be more important than gifts. But what do I know? Ahaha! I love that sign. I haven’t seen the new Star Wars movie yet, we were trying to wait until the crowd died down some before going to see it. I heard it was really good and that people really liked it. Though, I don’t think I would be able to force myself to hold having to go to the bathroom and be uncomfortable, when I know that I can always catch it again when the movie comes out later on DVD. That’s just me though. Anyway, you looked cute! I really don’t entirely mind working a bit on Christmas Eve depending on the time. I haven’t seen the Star Wars movie and considering I’ve only seen parts of episode 1 and all of 3 likely won’t happen anytime soon. Though I do enjoy Star Wars. I’m not like huge on it, but its cool. You look so cute in those outfits! Today’s kids really need to rewatch their Disney if they are mistaking you for Elsa, and that’s because they’ve missed out on a A LOT if they haven’t seen the classic Disney movies! I haven’t seen the first 6 episodes of Star Wars yet but I really want to, someday! The force is strong with me, just I’m waiting for a group of people to do a marathon with. And that needs to be a group who haven’t seen it, or they are such big fans they’re willing to watch all 6 with me hehe. Also, I LOL’ed at the app. Genius. 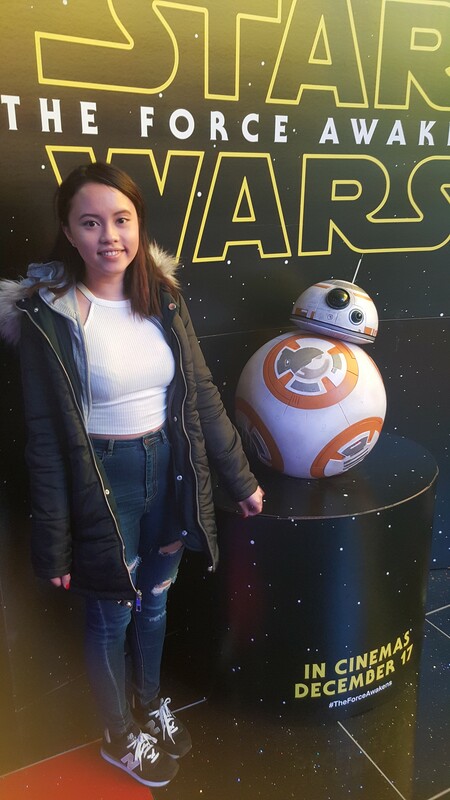 Omg BB-8! I got a mini iPhone controlled one, that rolls across the floor – it’s so cool! The film’s amazing too, no spoilers on here though! Someone actually put a pretend spoiler on Facebook and I was so mad. Luckily it didn’t happen in the actual film or I’d have been fuming. I love your outfits! That is definitely Snow White, what were they thinking?! Socks are the best Christmas presents, but then I’m at that age where I really appreciate the useful gifts. Who doesn’t want warm feet? I also struggled to get into the Christmas spirit this year, and I think it was because I couldn’t go home until December 23rd. I don’t envy you working in retail over Christmas. I did it for two years so I know how it feels. I purposely didn’t have a drink before going to Star Wars because I was determined not to miss any! I really enjoyed it. I thought it was hyped up too much but it was still good. You look great in both outfits! I really like the Santa one on the right! I think that’s funny that someone managed to mistake you for Elsa though. Snow White and Elsa don’t look alike at all! 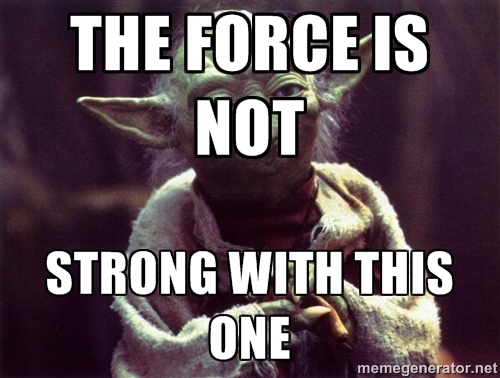 Aahh, I’m excited about Star Wars. It’s been hard getting tickets, so I don’t see it until later this week. Can’t wait though! CUTE CUTE OUTFITS! Also dressed up a bit this year and I’ll discuss that in one of my future posts. I guess we’re kinda growing out of Christmas right? But I’ll never grow out the importance of it. It’s not all about Santa and gifts anyway and I agree that people shouldn’t be so ungrateful on that day. OMG I wasn’t a huge Star Wars fan and was just probably a follower before but after seeing TFA 2x, I am absolutely over the GOOD SIDE! haha! I LOVED THE MOVIE! I will also dedicate a post for it soon. Just fell in love with it and the characters and everything! 🙂 Such a great tribute to fans, old and new alike.